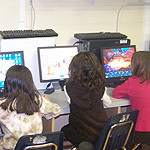 Founded in 1986, All Saints' Church Pre-School is a New Jersey State licensed pre-school and child care center conforming to all regulations governing child care centers. All Saints' Church Pre-School is sponsored by All Saints' Episcopal Church, and is conducted without regard for race, color or creed. We aim to enrich our students physical, emotional, social and intellectual growth, guided by a professional teachers and staff. Our school, designed for infants, toddlers, pre-schoolers, kindergarteners and school age students, is dedicated to the happiness of these children. We strive to build a warm relationship between the teachers and the students which will strengthen the bond of understanding, affection, respect and tolerance for each other. Administration: The Director, Mrs. Paulette Gilchrist and the Office Manager Gail Thorne, have worked at All Saints' Church Pre-School since the fall of 1986. Mrs. Sonja Rynander, the Assistant Director joined the staff in 2006. Staff: Our staff is caring, well educated and professional. They are required to complete ten hours of training annually, as well as keep current in educational trends and CPR training. Our staff is re-certified every two years in infant and child CPR training. Hours of Operation: We are open from 7:00AM to 5:30PM Monday through Friday, 12 months a year, other than those days designated as school holidays. We also offer an extended hour until 6:30 pm available upon enrollment. Meals – Breakfast, lunch and two snacks (AM/PM) are included for full day students. Lunch and an AM snack are included for all half-day and three-quarter day students. 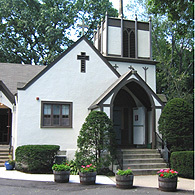 Buildings and Grounds: All Saints' Church Pre-School is located in a quiet, residential neighborhood. The facility is equipped with an automatic fire detection and suppression system in compliance with all fire safety codes. In addition, the building is completely air conditioned. There is a large, fenced-in playground that boasts beautiful shade trees. 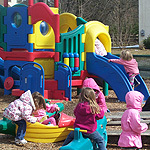 Wood chips abound for safety and enhance aesthetics, as the children enjoy a variety of age-appropriate playground equipment. Parent Involvement: Parents are always encouraged to participate in all activities. 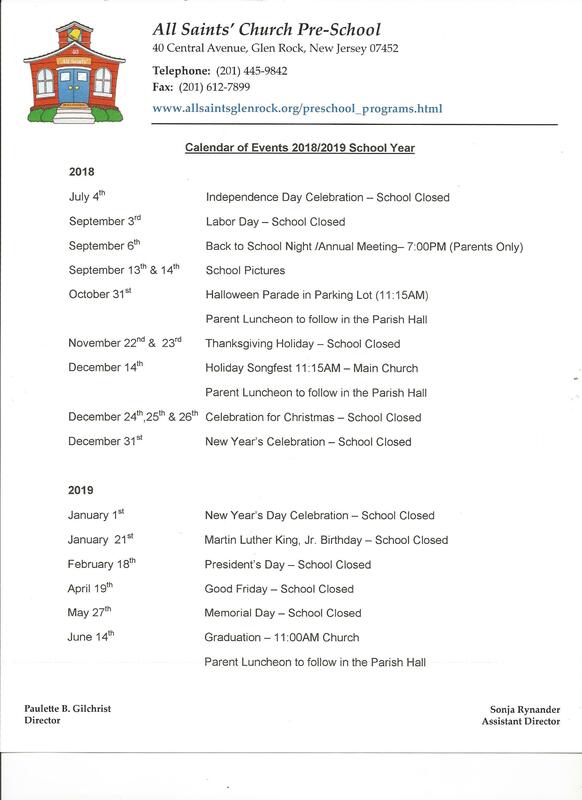 They are invited to attend all holiday luncheons, as well as attend our Back to School Night in October, and our Parents' Night in the spring, which is set up as a workshop or seminar with guest lecturers. These workshops cover contemporary issues and/or concerns. We also offer parent conferences upon the request as well as invite parents to visit and share their special talents with our students. Field Trips: We feel it is important for our students to venture outside our classroom walls and playground to broaden their learning experiences. A field trip is a first hand experience that has definite educational objectives. Tuition is due on the 1st of each month. Checks should be made payable to “All Saints’ Church Pre-School”. Payments made after the 10th of the month will be charged a $15 late fee. All tuition must be paid in full each month. A fee of $30 will charged for all returned checks. Information: For additional information, you may contact us by phone at (201) 445-9842 or email us at paulette@allsaintsglenrock.org. 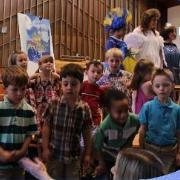 Class placement is dependent upon child’s age on October 1st for the Kindergarten Readiness and Kindergarten Classes. Placement for Pre-School 3 year old class is dependent upon the child being able to walk without assistance, use a cup (bottles and pacifiers are not allowed), nap on a mat and be able to sit at the toddler table for meals. These determinations are made by the administration with input from the child’s teacher/caregiver.